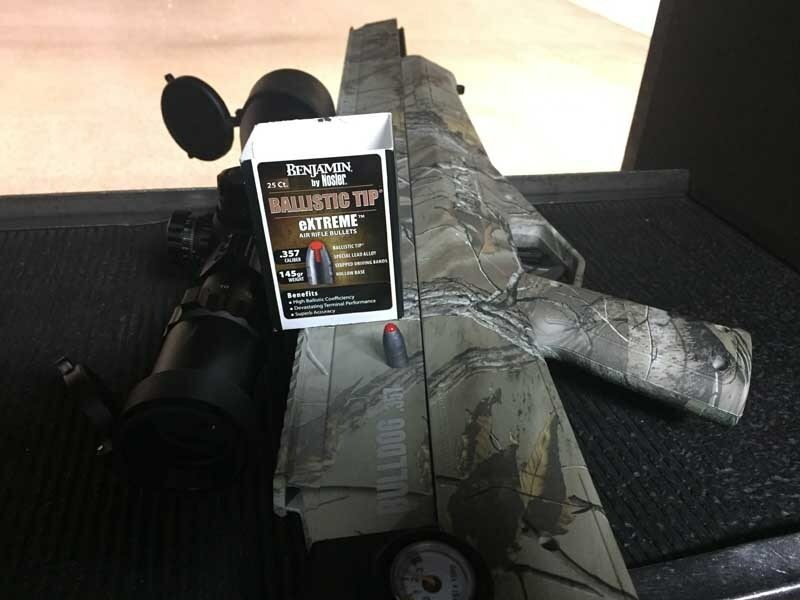 As the shift to the extreme long-range shooting continues to gain momentum and hunters at any distance expect stellar terminal results, ammunition manufacturers keep pace with new technology. A few throwbacks have found their way into the mix as well. Here are some of our most anticipated hunting ammunition finds from SHOT. 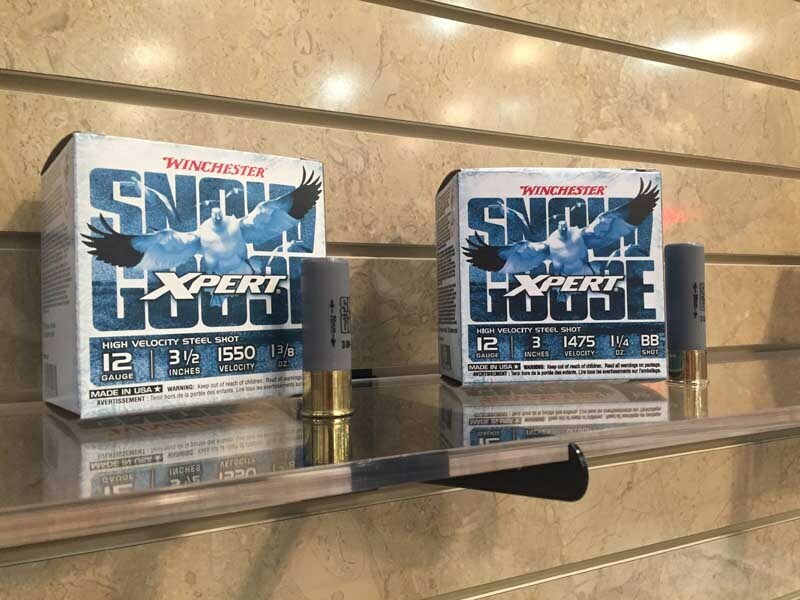 The Sierra Gamechanger line of hunting ammunition indeed marks a major shift in the market. 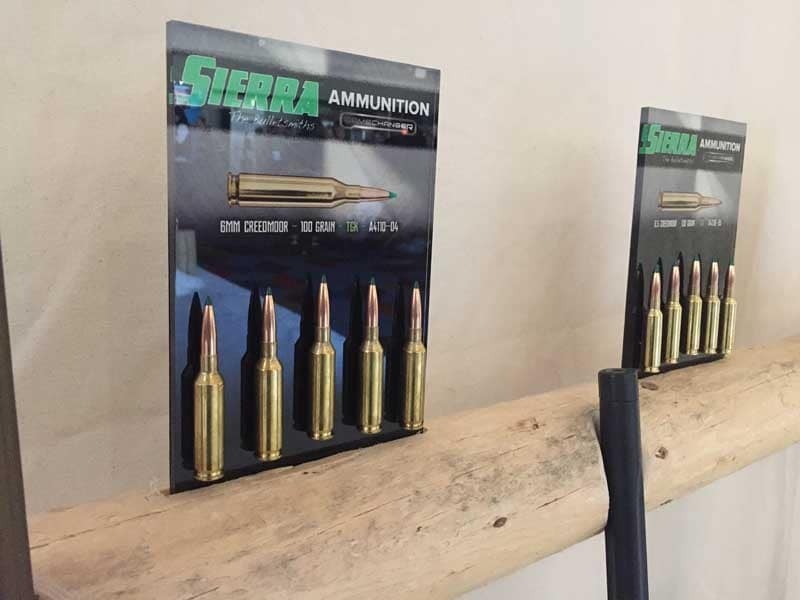 Previously, Sierra was known for their bullets, but now, it’s full speed ahead with premium ammunition. The Gamechanger loads make use of Sierra’s proven GameKing polymer-tipped bullets. Loaded ammo will initially be available in five calibers: .243 Win, 6mm Creedmoor, 6.5 Creedmoor, .270 Win, and .308 Win, with 7mm Mag, .30-06, and .300 Mag coming later in 2019. 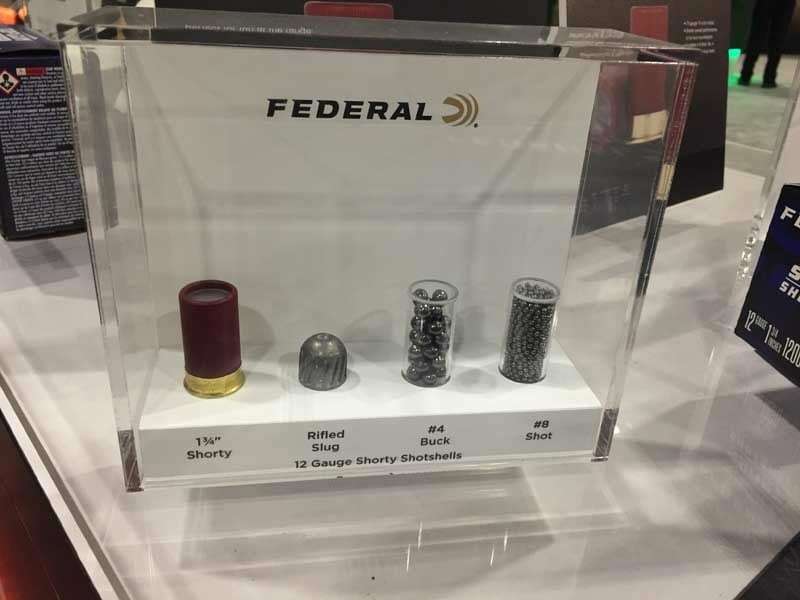 Despite dozens of other new ammunition offerings, none received the overwhelming interest as the Shorty Shotshells. Although they’re only 1-3/4 inch long, Shorty’s are advertised to “offer similar patterns, energy, and accuracy as full-size counterparts. The Shorty will be available in 12-gauge with a #8 shot, #4 buck, and rifled slug. 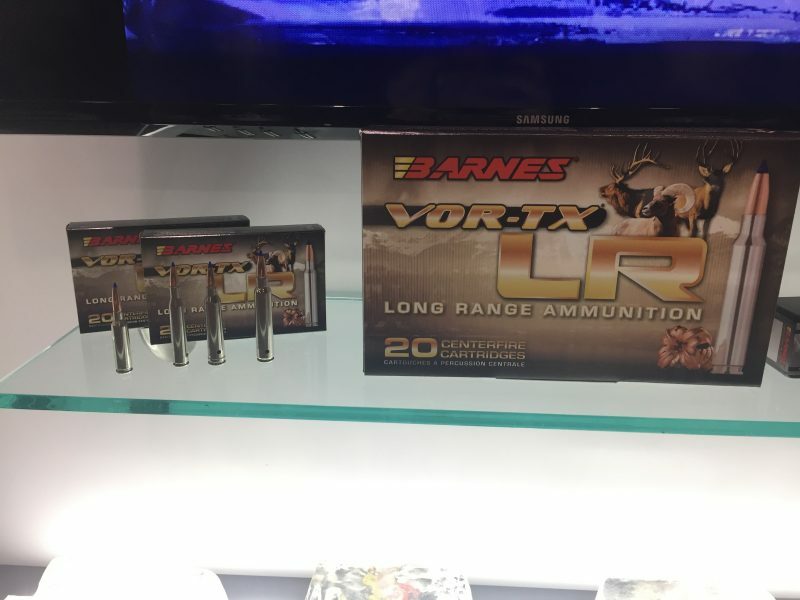 Barnes may be a little late to the long-range hunting ammunition party, but better late than never in the case of the new VOR-TX LR. They advertise it as “the world’s first hunting load optimized for one shot kills out to 700 yards and beyond.” While we don’t know about that, the new VOR-TX has plenty of potential. The new LR uses polymer-tipped LRX, all-copper bullets previously available only to handloaders. Nine calibers are slated to be available, from .30-06 and both “six” Creedmoors up to .375 Rem Ultra Mag. Long-range precision shooters have been acquainted with Norma for years, but now the company has thrown down its best load yet for serious hunters. The new BondStrike is “designed for extreme long-range accuracy and excellent performance on game at all distances.” The round uses a polymer-tipped, match boat-tail bullet. Five calibers from .308 to .300 RUM are listed in the initial offering, which is slated to begin shipping in Spring 2019. 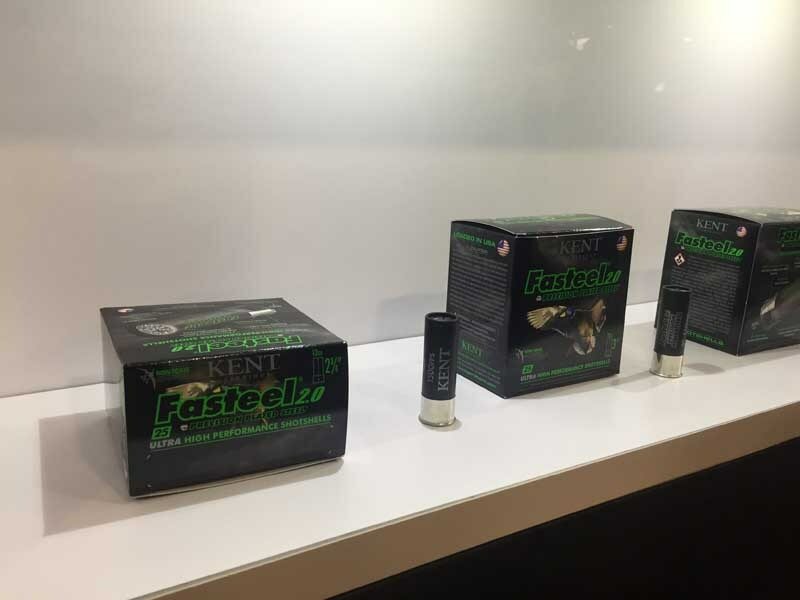 The fine folks at Kent Cartridge are pretty pumped about their new Fasteel 2.0 load, and rightfully so. The new Fasteel makes use of precision-ground zinc-plated steel shot for the hardest hitting patterns and custom double-base powders to “ensure consistent velocities in all North American weather conditions.” At 1560 FPS, the Fasteel 2.0 is one of the most potent non-toxic hunting loads on the market and a waterfowlers dream. In addition to extreme long range, 2019 is also the year of Tunsten. 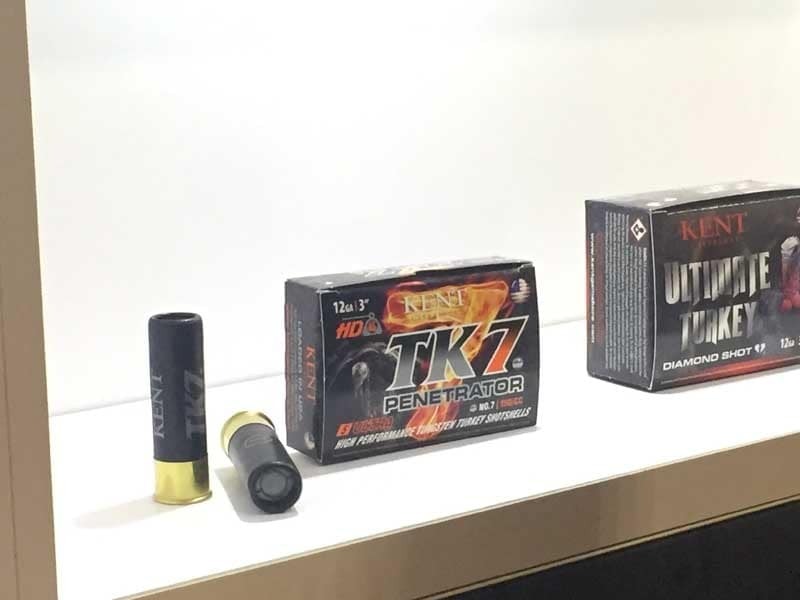 Kent takes full advantage of the tungsten edge with their new TK7 Penetrator turkey loads. The “7” represents an obscene dose of #7 tunsten pellets moving at 1,100 FPS. For those curious about the math, that’s 60 percent more shot than an equal lead load. Two options are available, both three-inch, in either 12- or 20-gauge. The five-round boxes are pricey, but they’ll put a trophy tom down like nobody’s business. Remember those old collectible blue Peter’s shotshell boxes from decades ago? Well, now they’re coming back. 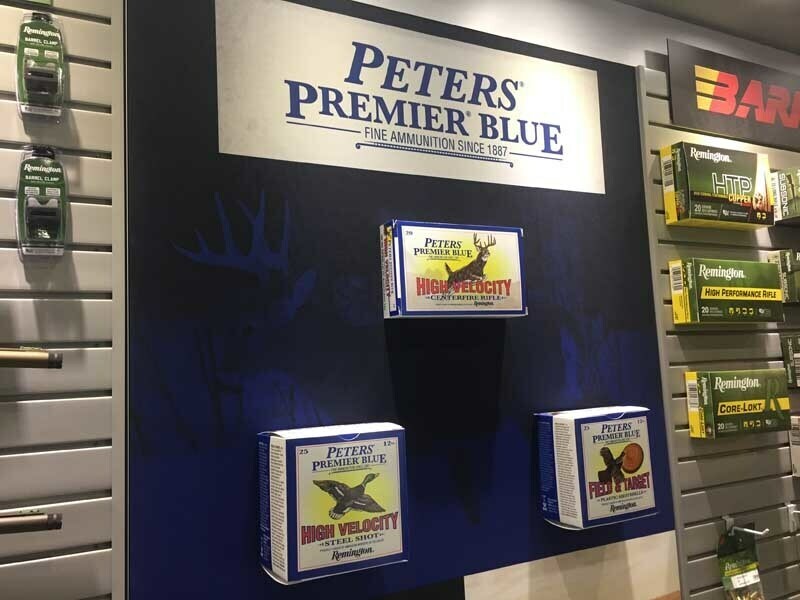 Remington announced the return of Peters Premier Blue shotshells in 12-gauge, with load options in BB, #2, #3, and #4, all using steel shot. The three-inch loads will feature blue hulls and throwback packaging. 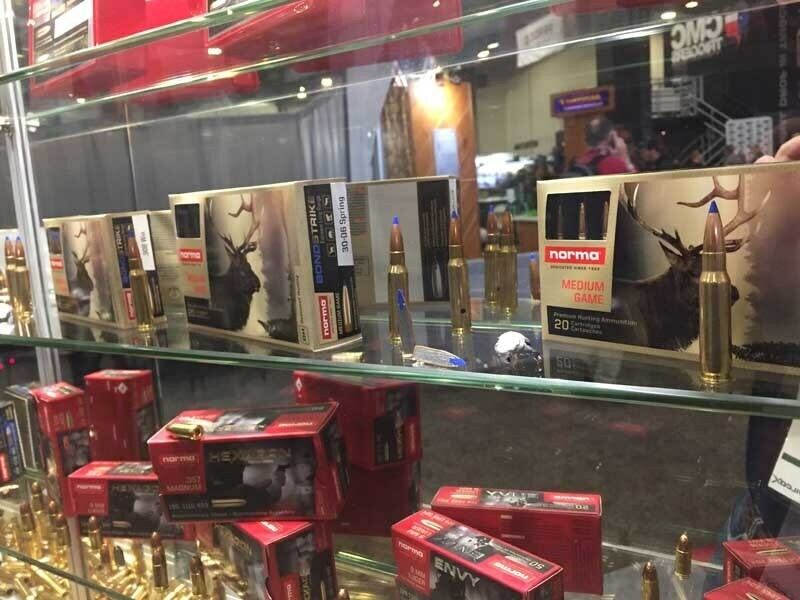 We hoped it wouldn’t take long for Hornady to jump on the Valkyrie bandwagon, and we got our wish in a big way. 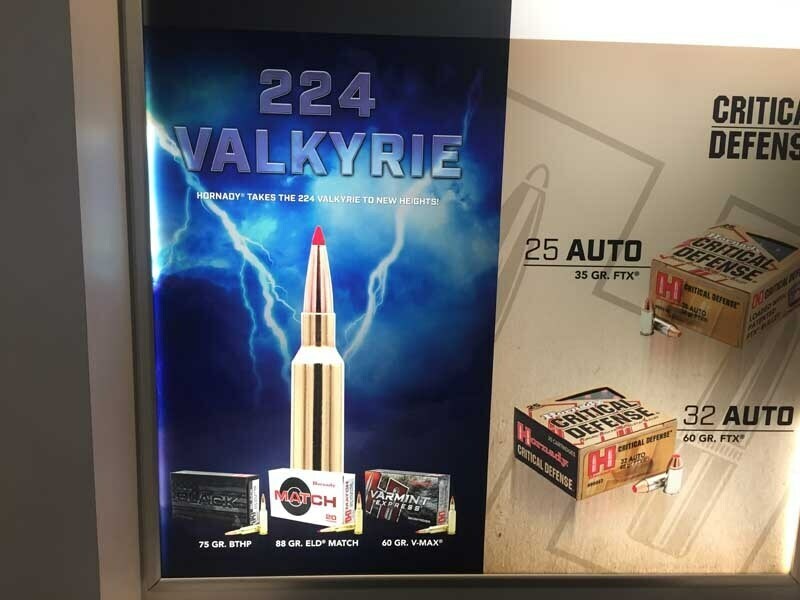 Hornady is showing off not one, but three .224 Valkyrie loads for 2019. There’s the 88-grain ELD Match, 75-grain BTHP BLACK, and 60-grain V-Max Varmint Express. That’s a nice mix for hunters and target shooters alike. If last year was the time for the 6.5 PRC to shine, 2019 is primed for the .300 PRC. 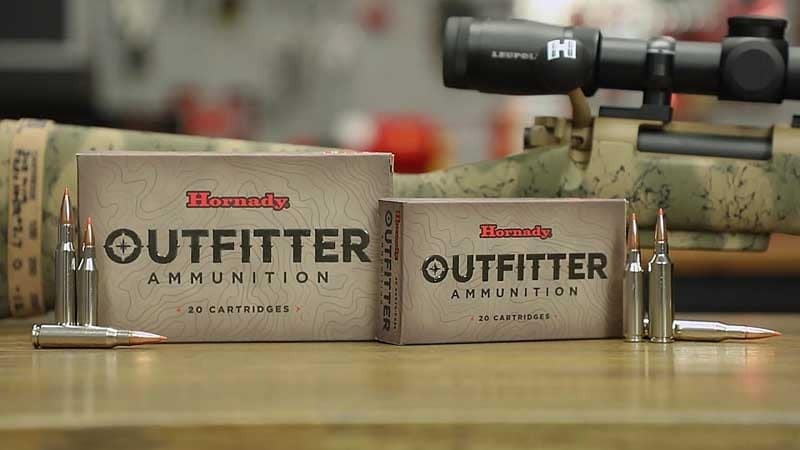 Hornady introduced the cartridge to “make long range, mid range.” Based on the .375 Ruger case, the .300 PRC is built to take advantage of the longer, heavier bullets. The non-belted round is currently coming in 225-grain ELD-Match and 212-grain Precision Hunter. Just when you’re thinking this is another passing fad, think again—the US Army just adopted the .300 PRC for its extended long-range sniper program. 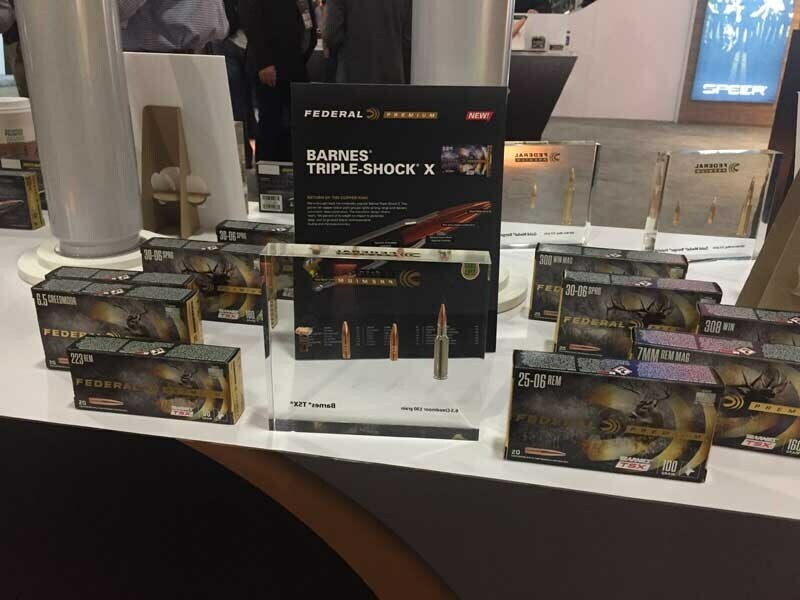 Federal Ammunition is greatly expanding its family of .224 Valkyrie ammunition with three new and interesting loads. First, the Varmint and Predator is loaded with 60-grain Hornady V-Max bullets, ideal for prairie dogs to coyotes. We’re especially excited to see a pair of Federal Premium offerings. The 80.5-grain Gold Medal Berger Match is perfect for long distance target shooting, while the 78-grain Barnes TSX copper hollow point is capable on deer-sized game. The Federal Premium branding is back in a big way with a full contingent of the Barnes Triple Shock (TSX). There is caliber for every hunter, with offerings spanning .223 Rem on up to .300 Win Mag. The all-copper Barnes TSX hollow point bullets use monolithic construction to retain maximum weight for the best penetration on game. 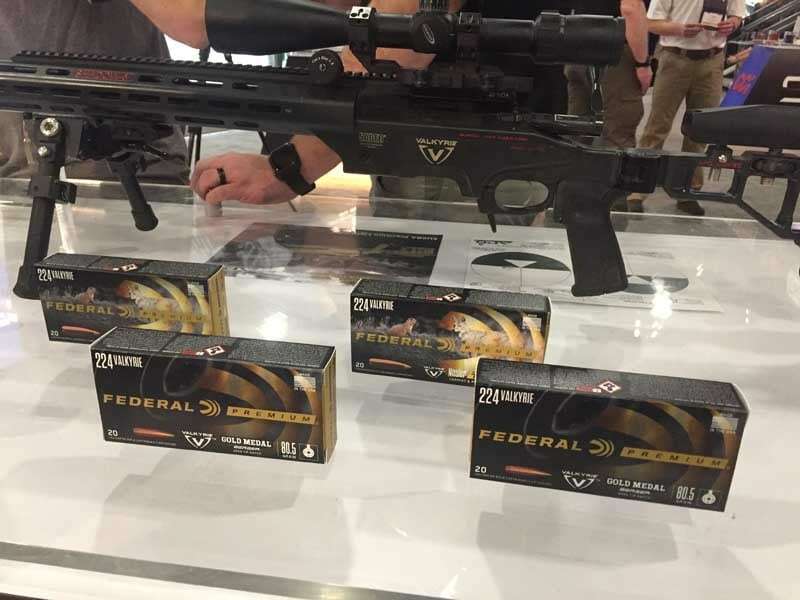 Hunters have long come to associate Federal Premium with handload quality. 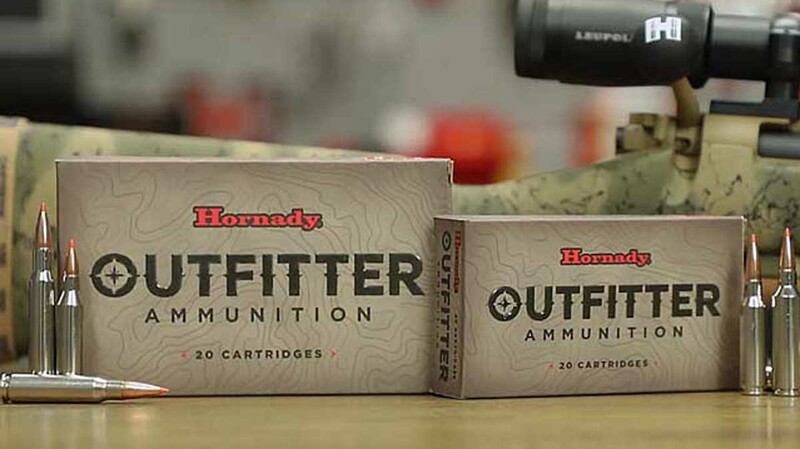 Hornady’s complete new line of Outfitter ammunition is built with the dedicated backcountry hunter in mind. Corrosion resistant nickel cases are advertised as “sealed watertight.” A dozen calibers from .243 Win to .375 Ruger are immediately available, all tipped with the company’s monolithic copper-alloy GMX bullets. 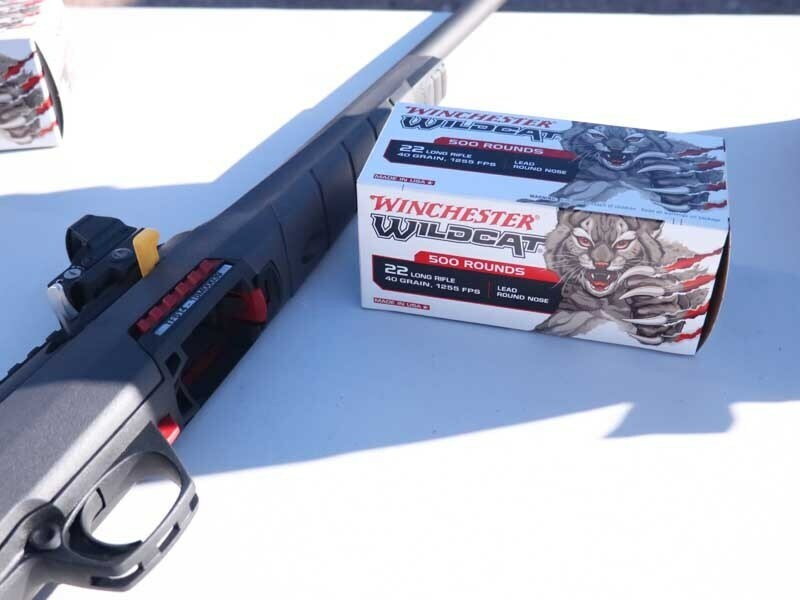 The updated Winchester Wildcat ammo wears a more aggressive, raging cat logo than in years past. It makes a sweet complement to the new semi-automatic rimfire rifle. Bricks of 500 rounds are available in 40-grain lead round nose. 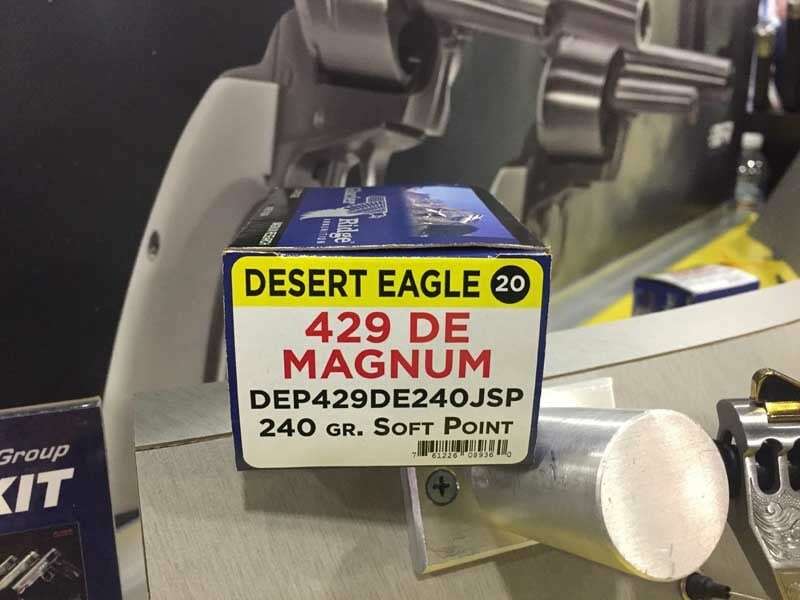 The Made-in-the-USA .22LR ammo is advertised at 1255 FPS. Winchester’s Xpert Snow Goose combines the company’s popular Xpert Steel Shot with the tight patterning Diamond Cut Wad used in Winchester Blind Side. Payloads and shot sizes are optimized for hunting snow geese, with two offerings in 12-gauge three-inch shells and two in three-and-a-half inch. Shot sizes are either a 1 and 2 mix or BB. Hunters will appreciate a purpose-built round for chasing those migrating white-wings. The grandiose announcement at SHOT is Winchester’s new Legend caliber. Ballistics indicate the new .350 Legend to have significantly more energy than both the .300 Blackout and .30-30 Win, with less recoil than both the .30-30 and .243 Win. Its straight-wall case design is of immediate interest to hunters, as a legal caliber in 47 states. 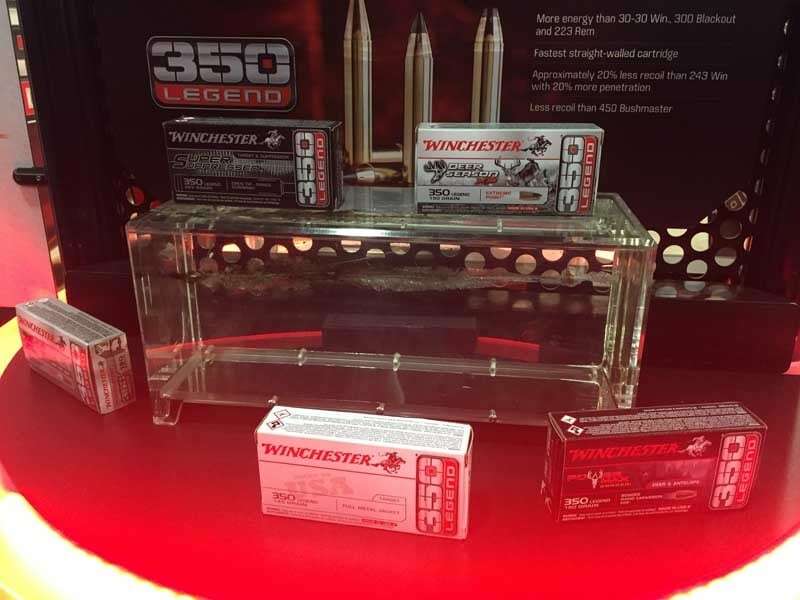 Further, Winchester touts the Legend as the fastest straight-wall round on the market. A wide range of ammunition will release simultaneously with the rifles. Offerings in ammo styles and weights cater to hunters, with bullet weights from 145 to 265-grains, including a Super Suppressed load. 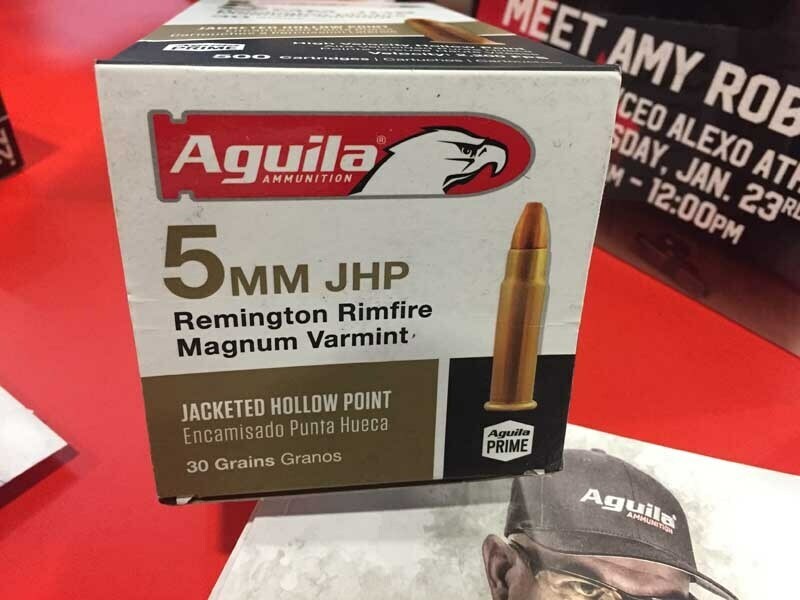 Cult followers of the 5mm Remington Rimfire Magnum have spoken and Aguila answered the call. Phone calls every day, that is, according to company reps, begging the company to re-make the once almost-extinct round. Take a look at the 5mm Mag’s ballistics and you’ll soon realize it should have never faded away, but rest assured, it’s back. Aguila is producing not only one, but two versions. Both are tipped with 30-grain bullets, but one is a JHP Varmint and the other a semi-jacketed load, both with an advertised muzzle velocity of 2,300 FPS. My old Remington rifle will be resurrected from the vault. Purpose built for hunters, the new .429 DE caliber is the star of the show for handgun hunters. The hot chambering will find its home on Magnum Research’s Mark XIX six-inch barreled stainless Desert Eagle, though other barrel options are out there. The cartridge advertises 25 percent more velocity and 45 percent greater energy than the .44 Magnum. The .429 DE is made with Starline brass and loaded by HSM with either Speer or Sierra bullets. Nosler teamed up with Crosman to offer the first ever Nosler Ballistic Tipped bullet for an airgun. Nosler’s eXtreme Air Rifle Bullet for the Bulldog rifle is a .357 caliber lead alloy in 145-grains. The bullet is designed with hunters in mind, as the eXtreme is intended to provide devastating terminal performance on game. Airgun hunting has never been so interesting.